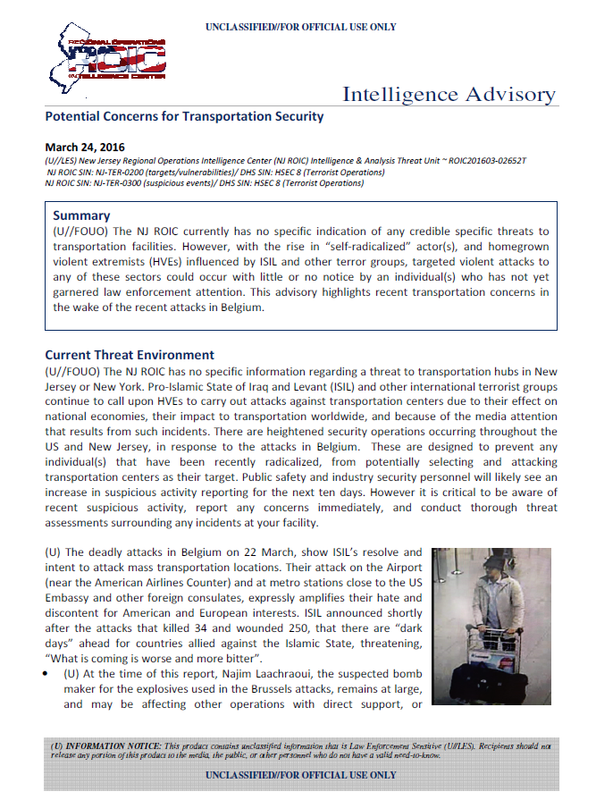 (U//FOUO) The NJ ROIC currently has no specific indication of any credible specific threats to transportation facilities. However, with the rise in “self-radicalized” actor(s), and homegrown violent extremists (HVEs) influenced by ISIL and other terror groups, targeted violent attacks to any of these sectors could occur with little or no notice by an individual(s) who has not yet garnered law enforcement attention. This advisory highlights recent transportation concerns in the wake of the recent attacks in Belgium. (U//FOUO) The NJ ROIC has no specific information regarding a threat to transportation hubs in New Jersey or New York. Pro-Islamic State of Iraq and Levant (ISIL) and other international terrorist groups continue to call upon HVEs to carry out attacks against transportation centers due to their effect on national economies, their impact to transportation worldwide, and because of the media attention that results from such incidents. There are heightened security operations occurring throughout the US and New Jersey, in response to the attacks in Belgium. These are designed to prevent any individual(s) that have been recently radicalized, from potentially selecting and attacking transportation centers as their target. Public safety and industry security personnel will likely see an increase in suspicious activity reporting for the next ten days. However it is critical to be aware of recent suspicious activity, report any concerns immediately, and conduct thorough threat assessments surrounding any incidents at your facility. (U) The deadly attacks in Belgium on 22 March, show ISIL’s resolve and intent to attack mass transportation locations. Their attack on the Airport (near the American Airlines Counter) and at metro stations close to the US Embassy and other foreign consulates, expressly amplifies their hate and discontent for American and European interests. ISIL announced shortly after the attacks that killed 34 and wounded 250, that there are “dark days” ahead for countries allied against the Islamic State, threatening, “What is coming is worse and more bitter”. • (U) At the time of this report, Najim Laachraoui, the suspected bomb maker for the explosives used in the Brussels attacks, remains at large, and may be affecting other operations with direct support, or motivating other would be HVEs through his successful attack and evasion. A home related to him in Brussels was searched and more bomb making materials were found. • (U) Germany recently declared Syrian and Iraqi passports issued in territories controlled by ISIL as invalid. German authorities stopped recognizing passports less than a month after French authorities found Syrian passports on the bodies of two men involved in the November 13 attacks in Paris. The German Interior Ministry warned that passports issued from Deir el-Zour, Raqqa and al-Hasaka in Syria, and Mosul and Anbar province in Iraq are invalid and their bearers’ identities are considered unconfirmed unless they can provide other documents (NY Times). • (U) State Department Travel Warning – The U.S. State Department has issued a travel warning to all Americans living in or traveling to Europe following Tuesday’s terrorist attacks in Brussels. The alert warns that that the Islamic State and other terrorist groups continue to plan attacks throughout Europe targeting sporting events, tourist sites, restaurants and transportation. • (U//FOUO) Many transportation systems in major U.S. cities have increased their security postures. As a precautionary measure, TSA is deploying additional security to major city airports in the United States, and at various rail and transit stations around the country. TSA is also working closely with state and local law enforcement, airport and transit authorities, and the aviation industry in order to augment that security. (U//FOUO) The ROIC reviewed suspicious activity reporting (SARs) related to transportation threats in New Jersey. These items are in addition or amplifying those reported in the previous Daily Threat Overviews. • There are no credible threats specific to any particular transportation center or asset at this time. • 3/22/16, Robbinsville: Identified male had photos of ISIL beheadings/instructions to make IEDs. • 3/21/16, New Brunswick: Unidentified male taking panoramic video of train station intersection. • 3/11/16, Union: Identified subject reported their law enforcement identification lost or stolen. • 3/8/16, Jersey City: Identified armed subject dressed as a police officer at a mall. • 3/3/16, Garfield: Two photographs of unidentified subjects in possession of assault rifles and wearing military fatigues observed in a business. • 2/28/16, Lawrence: Identified male claimed during arrest to have terrorism funding information. • 2/27/16, Ewing: Unidentified male made telephonic bomb threat to homeland security personnel. • 2/26/16, Voorhees: Unidentified subject made implied social media threat regarding 9/11 attacks. • 2/26/16, Elizabeth: Unidentified subject was observed photographing airport infrastructure. • 2/25/16, Old Bridge: Identified juvenile made statements expressing interest in ISIS. • 2/21/16: New Brunswick: An identified business in New Brunswick, NJ, allegedly promotes ISIS/Terrorist related activities. • 2/16/16, Bayonne: Unidentified subject was photographing Port Elizabeth and the Turnpike. • 2/12/16, Linden: Unidentified suspects were observed on the New Jersey Turnpike, hanging out of the passenger side window of a vehicle with a NY registration taking photos of the oil refineries and the Newark Airport. • 2/6/16, Bayonne: Identified subject had .38 caliber ammunition in checked baggage at port. • 2/2/16, Hanover Township: Identified subject with a military style tactical vest was observed in the area of a commercial facility. • 2/2/16, Lawrence: Unidentified male made “jihadi” threats while patronizing auto retailer. • 2/2/16, Wall: Unidentified subject observed photographing the airport. • 2/1/16, Atlantic Highlands: An unidentified male subject acted strange while on board a ferry. • 1/30/16, Beachwood: Unidentified males overheard saying, “We’re doing business in Brussels,” on a domestic flight to Newark Liberty International Airport. • 1/28/16, Teterboro Borough: Unidentified male inquired about transporting explosives and ammo using a private air charter. • 1/20/16, Clifton: Juvenile student made a statement claiming her parents are members of ISIS. • 1/15/16, Toms River: Unidentified subject attempted to elicit information about traffic cameras and security cameras at a hospital. • 1/11/16, Lakewood: Identified subject at an MVC office, stated he was a terrorist. • 1/7/16, Hackensack: Identified subject made a comment about being a former terrorist, during a custody hearing in Superior Court.